You can get roughly 30 or so bite-size cheese puffs from this recipe. I used 3/4 cup, or 3 ounces, of sharp cheddar cheese. I routinely buy lean center-cut bacon so that's what I have in the house and that's what I used for this recipe. I went with 4 slices of the center-cut bacon and chopped them finely. I actually managed to pipe the dough into small mounds so they are about 2-bite nibbles per puff after baking. As you might suspect, the dough won't be smooth with bacon bits and cheese swirled into the dough. I used a wet fingertip to tap the tips down and I topped this batch of puffs with a little bit of reserved cheddar cheese. As I mentioned, I froze a bit more than half the batch for another day. To freeze, I piped the dough out into little mounds on a parchment-lined baking sheet. Freeze the dough until hardened, then pop them in a bag to bake (straight from the freezer, without thawing) another day. I'm looking forward to that! I somewhat nervously wondered if I'd get any lift off of the puffs with all the heavy filling I added to the dough. As you can see, they do achieve lift-off but maybe not to the extent you might be used to seeing. What you'll end up with is a very crisp cheese puff. The inside is just a bit soft and tender. There's a lot of air inside these so I think it's totally acceptable to eat at least 6...right? I served these with lunch. Incidentally, I made beans from scratch for the first time (starting with dried beans) last week! 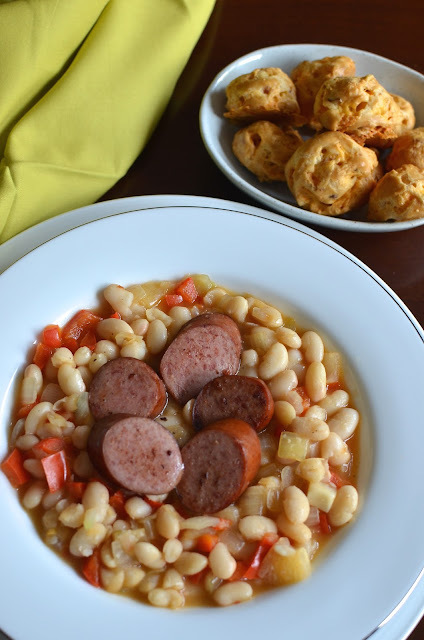 I ended up making up bowls of stewed beans (with some turkey kielbasa pictured below) and putting these cheese puffs on the table. Heat water, butter, salt, and paprika in a saucepan until butter is melted and mixture just comes to the boil. Add flour all at once and stir vigorously with a wooden spoon until dough comes together and pulls away from the sides of the pan in a smooth ball. Continue to cook for another minute (to dry out the dough). Transfer dough to a mixing bowl and let cool for 2 minutes. Add eggs, one at a time, quickly stirring to incorporate. At first, the dough will look lumpy but keep stirring vigorously and you'll see it come together. You should have a thick, relatively stiff dough at this point. Add cheese (you could reserve a bit to top the puffs with after piping, if you like) and bacon, stirring well to incorporate. Transfer dough to a piping bag fitted with a plain round tip (or use a freezer bag and cut out a tip, or simply use 2 spoons). Pipe the dough, evenly spaced apart, into small (about 1-inch) mounds. Bake for 10 minutes, then turn the oven down to 375 degrees and bake for another 20-25 minutes until puffs are completely golden. Serve puffs warm, if possible. The baked puffs can also be reheated in a low oven for 5-10 minutes. To freeze, pipe dough onto a lined baking sheet. Freeze until solid, then store in a freezer bag. Bake from the freezer, without thawing, adding an extra minute or two to the bake time. I've only made gougeres once, and they were savoury too - a cheese flavour. I think bacon would have been a terrific addition. haha - yes, 6 sounds about right, I think! : ) I wanted to use smoked paprika - it's got that bacon flavor going on - but I thought I'd keep it "safe" since my son is so picky. These were a hit with him. I still remember when I made my first pate a choux! It was a disaster! It took me 5 whole attempts to finally get the consistency right! But once I did, i just couldn't stop making them! These savory ones look sooooo GOOD! I love this classic bacon + cheddar cheese combo! I love the sharpness from the cheddar! Can't wait for the Holidays to start! Also, can you believe it, 2015 is almost coming to an end! WHERE DID THE TIME GO!!!!!! You can never go wrong with the combo of cheddar and bacon...these gougeres look fantastic, Monica. I played it safe, yes. : ) Thanks! Oh my my boys would have inhaled the whole plate in nano-seconds...cheese, bacon..bread. What is not too like here... shared! Not that I don't like cheddar and bacon but the combo does seem especially popular with the fellas! Thanks, Bam. These tasty little bites will be perfect to serve with cocktails. I have two couples flying down for a visit in a couple of weeks and I know they will love them. Definitely worth the effort for guests. Great salty bites with cocktails for sure! I made cheddar gougeres for an appetizer party for the first time last New Year's. Everyone loved them, but oddly, I don't think I had any with champagne. I will have to remedy that! 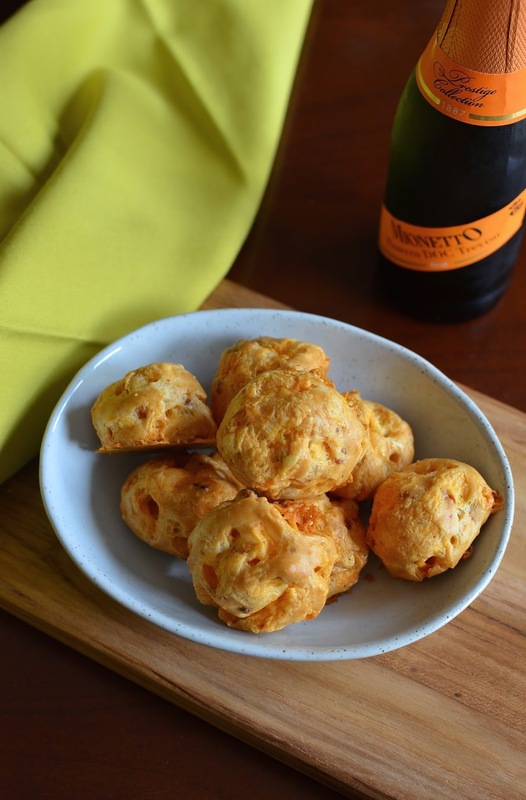 The addition of bacon makes cheddar gougeres even better! Though I most often buy turkey bacon (we rarely eat anything pork at home), I am interested to learn more about the lean center cut bacon you use. Do you get that at the butcher counter or prepackaged? It's just prepackaged right with the rest of the bacon...it'll be labeled center cut. Hope that helps! Give me cheese and bacon and that's all I need! I think I'll make these for my Halloween party this weekend. Thanks for the awesome recipe! You can't go wrong with bacon and cheddar! These cheddar and bacon gougeres look fabulous! This looks like a fantastic dish, Monica. Love how gorgeous, delicious and easy they are! Hi Monica, I love how you made these savory with the bacon and cheese. I am going to make this for Christmas, did not realize you could make them ahead and freeze them for later or I might of tried something like this years earlier. Thanks!! Cheri, I remember the first time I realized you could freeze scones! It was a revelation...and I've discovered so many things freeze so well and now, I am always thinking about that and it always helps me to freeze things since we need small portions at a time...I can't wait for a good occasion to bake the rest of this batch up! They are crispy and then just collapse in your mouth since it's so airy. That's the fun part...you end up being able to eat so many and wonder where it all went! Cheddar and bacon is my favorite combo. Yum! I always wondered whether all these heavy add ins would work and the puffs would still rise. It works, even if it's not the very lofty puffs we typically get with plain sweet pate a choux. My son is really the one who'll be like "YES!!" and my husband will just eat the whole twice baked potato, skin and all, when I make it. It's fun to watch. These puffs are good...you can just have one or two and not overload on it. Yes, the make-ahead, leave in the freezer aspect is awesome! I'm looking forward to all the holiday and party talk coming up! I love gourgeres! They look delicious - bacon and cheese is a delicious flavour combo! I could eat an entire plate of these right now! I know...these salty bites are too easy to eat! Thanks, Jess! These look fabulous! I could definitely eat them all up! So many pockets of air, you just need at least 6! ; ) Thanks, Amy!